Meeting Sydney was very special. I was at the Westminster Dog Show when I discovered Sydney’s story. This Tibetan Terrier was attached by a Bobcat. The vets did not think she would live and if she did they thought she would loose her leg. 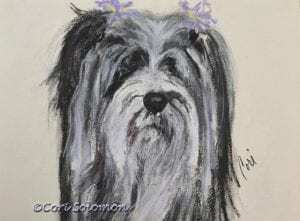 Fighting the odds Sydney persevered and went on to become number 5 in Tibetan Terriers in the country. This drawing of Sydney was a finalist for a Maxwell Medallion Award in the 2013 Writing Competition sponsored by the Dog Writers Association of America. Cori received a Certificate of Nomination for excellence in the category of Graphics – Single Illustration or Painting. To read more about Sydney’s story click here and check out the article I published about her on Dogster.com. To purchase this drawing email Cori.